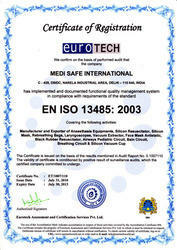 Medi Safe International is manufacturer, supplier and exporter of anesthesia equipment. It is not only the platform that deals with saving of life but also give all health care treatments for which we are dedicated to work with the enhancement in technology equipments are changing in every field in the era of digital technology. We engaged on this to manufacture, supply and export our equipments using latest technology by taking care the need of client and understanding value of life. We are the globally renowned International company with name Medisafe International, was established in and has since been engaged in the import and export of Medical equipments, Hospital equipments, Surgical equipments, Laboratory equipments, Scientific & Educational products worldwide. Our products include anesthesia equipment, artificial resuscitators, silicon resuscitators, silicon masks, black rubber resuscitators, rebreathing bags, bain circuit, etc. all these products featuring the latest technology are 100% safe to use. We sophisticatedly design these equipments by following international standards in order to achieve best quality and safe use. We understand the value of everyone's life therefore we manufacture products with utmost care and precision. We believe in high profile trading proportionally client satisfactions throughout the globe to achieve highest level of marketing in trade of our medical equipment. Most valuable thing for everyone in this world is Life, the only thing that is god’s gift. By understanding the value of life we are Medisafe International, always work towards improving the quality of our product range. Quality Analysis is always undertaken to maintain uniformity of standards of quality. Our all the manufactured equipment are tested with by experts with latest testing equipment and are given to our clients for testing as a trial basis to get their feedback. 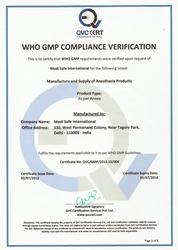 After confirmation of positive feedback we allow our products to go out of our company This whole quality analysis process is always monitored by a expert team of quality analyzers or supervisors, whose experienced understanding & knowledge of the product range allows us in identifying quality degradation if any and improving that for to achieve top quality. Our huge success in our endeavor to provide quality medical equipment to our customers is ably supported by a robust infrastructural setup. Medisafe International is empowered with state of the art machines along with highly qualified medical professionals. We have a vast manufacturing unit that has been installed with latest technology and facilitates providing smooth flow of production. All the machines undergo regular up gradation to avoid any kind of wear and tear. Experienced and well qualified doctors and other medical professionals are employed to produce excellent quality raw materials. Our Research & Development unit undertakes intensive and detailed research to look for path breaking innovation in the medical field. We also possess a huge warehouse with all the requisite facilities that can easily store loads of products and meet all kinds of market demand in an efficient manner. 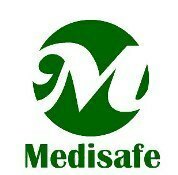 We "MEDI SAFE INTERNATIONAL" is The leading manufacturer of Anesthesia , Medical & Surgical Products since more than 16+ Years. We are exporting all around the world. Our products range i.e. Silicone Resuscitator (Ambu Bag, Reanimation Bag), Resuscitation Kit, Rebreathing Bag, Vacuum Extractor, Silicone Vacuum Cup, Lung Exerciser (Respiflo, Respirator Exerciser), Laryngoscope, Optic Fiber Laryngoscope, Bain Circuit, Anesthesia Circuit, Ventilator Circuit, Ventilator Circuit with Double Water Trap, Pediatric Jackson Rees'''' System, Mouth Opener, HME-Bacteria-PFT Filter, Humidifier Chamber, Oxygen hood, CPAP Mask, Ring Pessary, Stylet & Bougie, Oxygen & Nitrogen Regulator, Heated Wire Circuit, Humidifier Chamber & Bubble CPAP Circuits & Many More Products. Medisafe International is well known Medical & Surgical & Anesthesia Products manufacturer Company in india. We provides medical equipments services since more than 15+ Years..
Medisafe International is An ISO 9001-2015 & ISO 13485-2003, WHO-GMP & CE certified company. We are globally renowned company, established in year 1999 at New Delhi, India. We manufacture, supply and export Medical Safety Equipment that are designed and maintained along with latest technologies and are safe to use. We work towards client assurance. We believe in delivering high quality products. Support and consult throughout our partnership. We optimize our processes after establishment. Our team of experienced and professional doctors regularly works to produce and enhance our medical products. Our research and development unit is always active to gather latest information regarding medical products. Our team always do detailed research work to bring innovation in our medical products.